From a Rutgers study published on October 25th, 2018 we find evidence of tooth loss related to malnutrition. Read that carefully, because it is stating that malnutrition is caused by tooth loss, and not studying the case of tooth loss due to malnutrition. We have been aware that chronic malnutrition causes a lack of vitamins that can lead to degradation of dental health and eventually tooth loss. Growing up while being malnourished causes a variety of developmental issues with teeth. 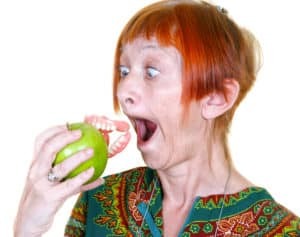 This study is showing a link to how having already lost teeth, the ability of a person to consume an adequate diet is adversely affected - and that leads to malnutrition. Older adults are at risk not only for impaired oral health. It notes the trend of 25% of patients with 10 to 19 teeth were more likely to be at risk for malnutrition. The study, published in the Journal of Aging Research and Clinical Practice, analyzed the health records of 107 community-dwelling senior citizens treated at the Rutgers School of Dental Medicine clinic between 2015 to 2016. The grant studied the impact of tooth loss on the eating experience and eating-related quality of life. Dentures and dental implants that restore the ability of a person to have a full set of teeth can not only improve quality of life but can provide the functional ability to eat a nutritionally appropriate amount. Malnutrition likely results because those without all their teeth find it harder to eat nutritionally diverse food. Avoiding consumption of fruit, vegetables, dietary fiber, calcium, iron, and other vitamins directly leads to malnutrition. And diets lacking these things lead to weight loss and ultimately increased morbidity and mortality. Patients classified as having malnutrition had higher rates of weight loss, decreased intake and more frequently reported dementia and/or depression, and severe illnesses than those with a normal nutritional status. The study reported that more needs to be done to link tooth loss to malnutrition, but had one actionable takeaway. Dental exams and clinics may be an ideal location to perform nutritional status screenings. They can provide patients with referrals to Registered Dietitians and community assistance programs such as Meals on Wheels. It is hoped that by taking proactive steps and having regular checkups as an older adult, we can help to prevent further decline in nutritional status.